Enterprise service management (ESM) tools can easily keep IT on par with the scale and speed demands of modern business. But in an increasingly crowded IT service management market, it can be hard to quickly discern the key differences from one ESM vendor to the next – and ultimately choose the right platform for your business. 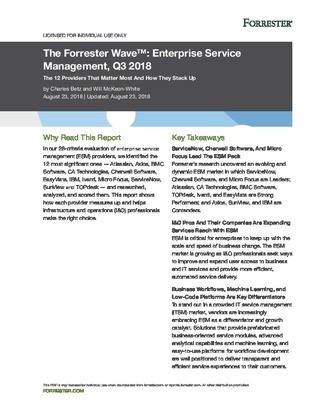 In this Forrester analysis, find out how the top 12 enterprise service management vendors stack up – and which are leading the pack.